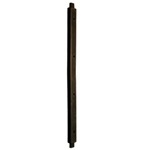 Gasket, windshield division bar.Length: 14.0 inches. Width: 1.0 inches. Gasket, divided windshield center post. Combines inner and outer gasket in one piece as original. Seventeen (17) inch to (20) inch lengths.Length: 20.